I have posted on one of my major holdings Level 3 (ticker LVLT), a facilities-based provider of a range of integrated telecommunications services, many times before, most recently here. One of the features of LVLT is its volatility and the past weeks have proven no exception. LVLT broke below $50 in late June to $47 before being buoyed to above $56 by a unsubstantiated rumour that the firm was “reviewing strategic alternatives to maximize holder value, including outright sale or large buyback”. After the quarterly report on the 27th of July when LVLT reported disappointing revenues but beat on the bottom line, the stock is now down below $50 again without any news from the firm on buybacks or M&A. The revenue figures, particularly the increase in CNS monthly churn to 1.2%, was disappointing with the loss in accounts been driven by SME enterprise customers. One possible reason for the lack of focus was the temporary absence of the CEO due to a heart issue earlier in the year. 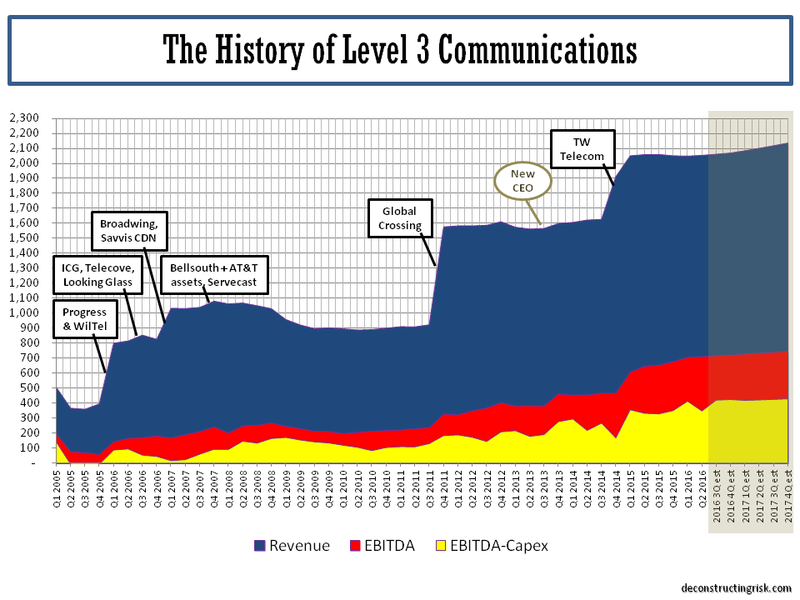 As the chart below shows, LVLT does have form with revenue dips after initial successful M&A integration. Many, including me, thought that the current management was more on top of the issue this time around. Despite this disappointment, the revenue impact is likely to more contained this time around and I believe the case for LVLT in the longer term remains strong. I have reduced my revenue estimates in the graph above but the free cashflow that LVLT’s business is throwing off makes the bull case. My PV cash-flow analysis still has a price target of over $65, which represents a 2018 EV/EBITDA multiple of slightly below 10. Although the multiple is high compared to the incumbent US telcom giants, I think it is warranted given the quality of LVLT’s assets in an ever data hungry economy. The current favourable, albeit political, regulatory trends (net neutrality and the ban on lock-up agreements) are another plus factor. I estimate that the FCF generated by LVLT could, in the absence of any M&A, mean the firm could afford $1 billion of buybacks in 2017, rising by $250 million a year thereafter. An aggressive buyback programme over a five year period, 2017 to 2021, could amount to approx $7.5 billion or approx 30% of current share count at an average price of $65. One of the firms that the analyst was possibly referring to is Zayo, who interestingly just hired LVLT’s long time CTO Jack Waters. Zayo currently trade at over 10 times its 2017 projected EBITDA compared to LVLT currently at a 2017 multiple in the low 9s. Obviously a premium would be needed in any M&A so the synergies would have to be meaningful (in Zayo’s case with a 50% plus EBITDA margin, the synergies would likely have to be mainly in the capex line). COLT telecom is another potential M&A target as Fidelity’s self imposed M&A embargo runs out after 2016 (see this post). A significant attraction however is for LVLT itself to become a target. One of the US cable firms, most likely Comcast, is touted as a potential to beef up their enterprise offerings to compete with the incumbents. Other potential candidates include the ever data hungry technology firms such as Google or Microsoft who may wish to own significant fiber assets and reduce their dependence on telecoms such as Verizon who are increasingly looking like competitors. As ever with LVLT, the ride is never boring, but hopefully not ever ending…. This entry was posted in Telecom and tagged AT&T, CenturyLink, CEO Jeff Storey, COLT, COLT Telecom, Comcast, disciplined M&A, EBITDA savings, enterprise revenue, EV/EBITDA multiple, Global Crossing, global IP optic network, Google, google network, integrated telecommunications, intelligent network services, Interroute, Level 3, LVLT, LVLT enterprise revenue, LVLT share price, LVLT valuation, Microsoft, pan-European network, S&P High Beta index, telecom EBITDA margins, telecom EBITDA multiples, telecom M&A, telecom operating margins, TW Telecom, Verizon, XO communications, Zayo. Bookmark the permalink.